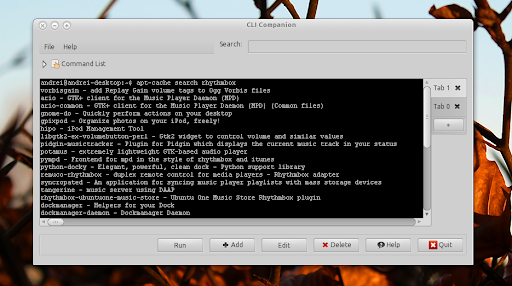 CLI Companion is a tool aimed at making the terminal easier to use: it's a GUI that displays a list of commands and an embedded terminal under it. The application comes with a list of commonly used commands by default, each having a short description and if you want to find out more about a certain command, simply right click it and select "Help". 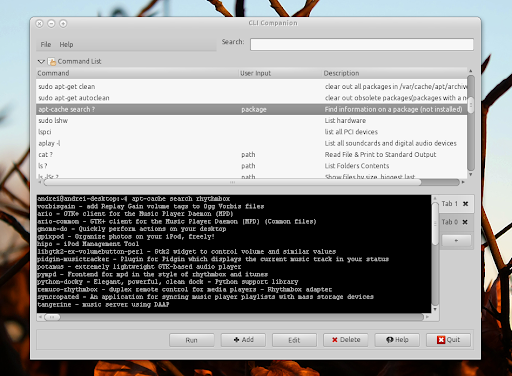 This will display the "man" (manual) for the selected command. 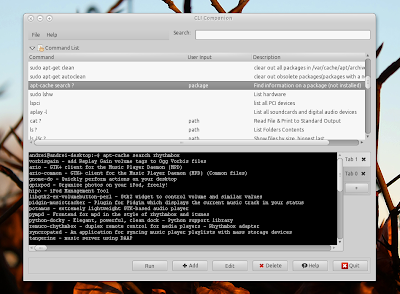 But CLI Companion can help advanced users too as you can use it to store long commands which you can then easily find using the search feature. The format commands are stored in has been changed. Commands requiring User Input when ran now use question marks(?) as place holders. So a command like 'ls /any/directory' would be added to your command list as 'ls ?'. This changed was required because the old behavior only allowed user input at the end of the command. You'll then find CLI Companion under Applications > Accessories.